We’d love your help. 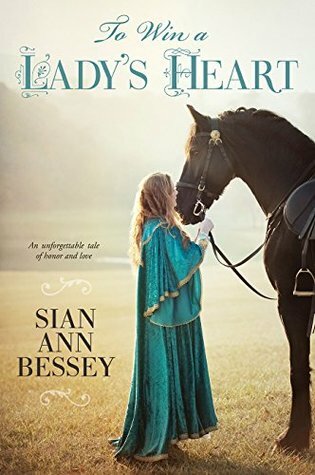 Let us know what’s wrong with this preview of To Win a Lady's Heart by Sian Ann Bessey. For eighteen years, Lord Gilbert has been tortured over a grievous lapse in judgment. Bitterness has tainted his interactions with the people of Moreland and his relationship with his only daughter, Lady Joanna. With a wolfhound guarding her around the clock and no freedom to leave the castle grounds unattended, the only time Lady Joanna can be alone is when she sneaks out through an old castle tunnel to visit the healer Agnes in her cottage by the sea. One morning as Lady Joanna approaches the cliffs, she discovers an injured man. She immediately goes to Agnes for help. The wounded stranger is Sir Lukas, and while he recovers, he makes plans to identify his attackers and their motive. Upon learning that Moreland’s wool has been stolen, Sir Lukas comes to believe that the crimes are related and point to a much more sinister plot. When Lord Gilbert announces an archery tournament, the prize being Lady Joanna’s hand in marriage, it attracts noblemen from across the land, and suddenly Sir Lukas’s pursuit of the villains takes a different turn. As Lady Joanna’s and Sir Lukas’s feelings for each other grow, the stakes soar, and only Sir Lukas’s skill with a longbow can save them. To ask other readers questions about To Win a Lady's Heart, please sign up. I was perusing audiobooks today and came across this one. I was so excited! I've been eyeing it since it came out. How could I not, I mean look at that cover! So gorgeous. The dress and that horse?!!! Not to mention that the synopsis called to me and many friends absolutely loved it when they read it several months ago. So I selected it and turned it on. It was a fabulous companion for my day. I had a lot of prep work to do for an upcoming trip and so while I was cleaning, doing laundry, making I was perusing audiobooks today and came across this one. I was so excited! I've been eyeing it since it came out. How could I not, I mean look at that cover! So gorgeous. The dress and that horse?!!! Not to mention that the synopsis called to me and many friends absolutely loved it when they read it several months ago. So I selected it and turned it on. It was a fabulous companion for my day. I had a lot of prep work to do for an upcoming trip and so while I was cleaning, doing laundry, making food and being mommy chauffeur I listened to, enjoyed and finished this gem. I can't resist a good medieval love story, fraught with danger, tournaments, horses, archery, angst, friendship and budding romance. While I was mommy chauffeur, my daughters were hooked. And when I say hooked, I mean absolutely deathly silence in my car. Not even one little peep came out of them. They weren't asking me questions, they didn't have any little fights with each other. Just completely, 100% hooked on the story. They of course came in at the last 15% of the story so it was a little bit more intense as it was building to the climax but they loved it! The beginning starts with a bang, or a roar, or a something to convey a traumatic experience. Altering a young baby's life for many years to come. Not only is baby Joanna's life altered but many other people belonging under the protection of Lord Gilbert have a big change in their lives. Flash forward many years and Joanna comes upon the remains of a dangerous scene. Once she does, she cannot turn back time and change her course. But the course it puts her on is dangerous and will unravel all secrets that have been held at Mooreland since the death of her mother when Joanna was born. Will she survive? Will she be able to protect those under her care? Can she reach her father's aloofness for her and break through his barriers to save their people? The love story was sweet and a good part of the story but I would say that it wasn't the main focus of the story. It does drive the story forward in several parts but the peril and mystery felt like it was more the main focus. I have enjoyed the books I've read by this author. My first book was Forgotten Notes, back when I was a young teenager. My copy has been read and reread so many times (by me and others) that the binding has come completely unglued and has sections of the book that are falling apart. I hate to replace it because it's a well loved copy but it just might be a necessity. LOL! Content: Clean. Some peril, nothing overly graphic and only a handful of sweet kisses. A wonderful cast of characters give heart to this medieval tale of loyalty and betrayal. I loved Lady Joanna's compassion for the peasants in her father's land, and her determination to champion their cause since they couldn't for themselves. Her secret relationship with Agnes and the two young men Agnes cares for proves to be beneficial when they come to her aid as the kingdom seems to be falling apart. The arrival of Lukas was timely as he helps solve the mystery of the stolen wool and reveal A wonderful cast of characters give heart to this medieval tale of loyalty and betrayal. I loved Lady Joanna's compassion for the peasants in her father's land, and her determination to champion their cause since they couldn't for themselves. Her secret relationship with Agnes and the two young men Agnes cares for proves to be beneficial when they come to her aid as the kingdom seems to be falling apart. The arrival of Lukas was timely as he helps solve the mystery of the stolen wool and reveal the culprits who are behind the plot to rob Joanna's father of everything. His goodness shines through in his kindness and devotion to Joanna, and I was rooting for him to win the tournament and her heart. Lord Gilbert's loyal knight Sir Edwyn was a steadying influence in Joanna's life as a father figure and his connection to Lukas brought the story full circle. This is a book that will be enjoyed by fans of Melanie Dickerson and I highly recommend it for both young adults and adults. I've always had a soft spot in my heart for stories of brave knights, beautiful and strong ladies, dastardly villains, and dangerous plots. With a fantastic assortment of characters, this story stole my heart and captured my attention from the first page. Lady Joanna is a devious young woman--but in a good way, if that makes sense. She takes risks to make friends, help others, and enjoy life a little, but has to do so secretly. She's the type of character that a reader can't help but adore, with I've always had a soft spot in my heart for stories of brave knights, beautiful and strong ladies, dastardly villains, and dangerous plots. With a fantastic assortment of characters, this story stole my heart and captured my attention from the first page. Lady Joanna is a devious young woman--but in a good way, if that makes sense. She takes risks to make friends, help others, and enjoy life a little, but has to do so secretly. She's the type of character that a reader can't help but adore, with her headstrong ways and her good heart. Sir Lukas is exactly the type of hero that charms the socks off a girl. He's strong, brave, loyal, and willing to do whatever it takes to uncover the glimpses of evil that he catches. With danger lurking around every dark corner due to a challenge that will win one lucky man Joanna's hand in marriage, it's up to this duo to save the day--in more ways than one. This book is just what my soul needed. I love the way the plot is spun into a swoon-worthy tale that has all the right elements to make a very intriguing story that is sure to enchant any reader. I was taken back to my youth, when I would dream of tales such as this becoming my reality, yet the book is realistic and consistent enough to be believable. I believe that good will conquer evil and that true love does exist. But I also know that it takes a lot of hard work to get to that happily ever after. This journey is definitely one worth reading about. Content: mild-moderate violence; mild romance. I love books that take me back to the time of Knights and Castles. There is always that imagery of chivalry that takes me back to childhood dreams of being a princess with a handsome knight (or two) to save and protect me. Now that I am older, I know that the dream had a dark side, that of vassals, outhouses, poverty, etc. This book had a great mix of my childhood dream and the realities of the time period. Lady Joanna is the daughter of a Lord. She is kept in beautiful gowns and has servants to I love books that take me back to the time of Knights and Castles. There is always that imagery of chivalry that takes me back to childhood dreams of being a princess with a handsome knight (or two) to save and protect me. Now that I am older, I know that the dream had a dark side, that of vassals, outhouses, poverty, etc. This book had a great mix of my childhood dream and the realities of the time period. Lady Joanna is the daughter of a Lord. She is kept in beautiful gowns and has servants to wait on her. While she may have comforts, there are many aspects of life she missed. She was not given freedom to roam away from her home. She is basically a prisoner to a small geographical area, mainly the castle. Her father is distrustful of most and doesn't give her time and attention. Lady Joanna is concerned with the vassals. She understands their concerns about paying taxes and does her best to try to help them not end up in the dungeon,. Sir Lukas comes to Moreland to give thanks to a knight that his mother owes a debt of gratitude. He is immediately set upon by men up to no good and now has information that may help end a ring of thieves. I loved the writing style of the book. I also love the time period and theme. Sian Ann Bessey gave me descriptions that helped me form images in my mind. I love it when an author can do that. She described the story in a way that appealed me. I also liked that there were dimensions to the characters. Lord Gilbert has demons from the past that effect the man he is in the story. Sir Edwyn made a decision that illustrate how a good decision can have impact on the future. Joanna shows a soft side, but she is a woman of determination and intellect. I love books set in medieval times with loyal and brave knights, beautiful ladies, archery tournaments and sinister plots! This book has it all. I just loved it! The characters were all so vivid in my mind. Lady Joanna is the perfect picture of kindness and loyalty. She loves her land and her people and has a desire to help them both thrive. Her frustration comes from not being allowed to really participate in decisions regarding either one and instead is shoved off to the side as a pretty ornam I love books set in medieval times with loyal and brave knights, beautiful ladies, archery tournaments and sinister plots! This book has it all. I just loved it! The characters were all so vivid in my mind. Lady Joanna is the perfect picture of kindness and loyalty. She loves her land and her people and has a desire to help them both thrive. Her frustration comes from not being allowed to really participate in decisions regarding either one and instead is shoved off to the side as a pretty ornament. Sir Lukas is the stuff of every young girl's fantasy. He is strong, smart and chivalrous. I loved his determination and his honor. Such a fantastic tale filled with Knights of honor, tales of sorrow, moments of valor, and of course a sweet love between a Knight and a Lady. I really enjoyed this refreshing tale! Maybe it’s because I love this medieval time period, or the unique beginning of this story, or that I’m tired of all these contemporary “billionaire” romance books. Whatever the case, this book was a breath of fresh air and had my toes curling in delight at the clean swoony romance! Lady Joanna is kind and giving, wi Such a fantastic tale filled with Knights of honor, tales of sorrow, moments of valor, and of course a sweet love between a Knight and a Lady. Lady Joanna is kind and giving, with a quiet inner strength that I loved watching her discover. Having led a very sheltered and isolated life, she slowly learns to become the “Lady” she is meant to be. Sir Lukas is the perfect dashing knight, with honor and courage in spades. He cannot stand idly by when something wrong happens. I enjoyed watching him fall for Joanna and work to protect her- in more ways than one. This tale will leave you feeling enchanted! You will read of a king and his castle. You will revel in knights and thieves. Your heart will melt for a simple-minded man, a young boy, and a women forbidden from the kingdom. Lady Joanna and her wolfhound with capture your attention and keep you reading long into the night. I completely recommend this book! ABSOLUTELY LOVED IT!!! Lady Joanna's mother died at her birth. Her over protective, grief-stricken father, Lord Gilbert, has seldom ever offered her kindness and barely acknowledges her existence. Thanks to a dear Lady's maid, a noble Knight, a banished healer, and a devoted Wolf Dog, she was raised with love and respect. The only problem is, in order to visit the healer - which is forbidden - she has to sneak out just before dawn, through a secret tunnel. She was in the process of doing so when she came upon a stran Lady Joanna's mother died at her birth. Her over protective, grief-stricken father, Lord Gilbert, has seldom ever offered her kindness and barely acknowledges her existence. Thanks to a dear Lady's maid, a noble Knight, a banished healer, and a devoted Wolf Dog, she was raised with love and respect. The only problem is, in order to visit the healer - which is forbidden - she has to sneak out just before dawn, through a secret tunnel. She was in the process of doing so when she came upon a stranger, lying in a clump, badly beaten and bleeding . She made a tourniquet out of her skirt, then ran to the healer's place for help. Two of the healer's "adopted children" assisted the ladies in rescuing the man and taking him to the cabin on the shore. it was doubtful he would survive. Lady Joanna was late so had to hurry back to the castle and hopefully sneak back in undiscovered. After arriving, her maid scolded her and informed her, Lord Gilbert had summoned her. To Lady Joanna's dismay, Lord Gilbert informed her of an upcoming occasion in which she had no say. With this, the fear of the poor man dying, and a doomed future, Lady Joanna felt she could no longer fight the tears. Was there no hope? The plot steadily unfolds and there is daring and danger, as well as, drama, intrigue and romance. the character seem real, the book cover and title are a great fit. The background scenes are also portrayed well. I loved the way this book sucked me back in time to a land of Lords, Ladies, Knights and their steeds, and castles. The whole setting of this one almost felt real to me, the author really did such an amazing job with that. The plot was awesome too, and I loved the way that the author has some notes at the end telling where she kind of got the plot from, so fascinating to see her process of how she came to it. I loved the way that the reader is as in the dark about who the villain is and the hero I loved the way this book sucked me back in time to a land of Lords, Ladies, Knights and their steeds, and castles. The whole setting of this one almost felt real to me, the author really did such an amazing job with that. The plot was awesome too, and I loved the way that the author has some notes at the end telling where she kind of got the plot from, so fascinating to see her process of how she came to it. I loved the way that the reader is as in the dark about who the villain is and the hero and heroine, that makes the book that much more interactive, because I for one was always puzzling out in my mind just who was after Lady Joanna and Sir Lukas. Lady Joanna is simply amazing. I love the way that in the beginning you see what happens to her as a baby and then you see the result for both her and her father. I loved that she was able to grow into the amazing and caring young woman that she was with no real guidance from a parent figure, her mother had died and her father keeps her at arms length with no real love and affection. Then there's Sir Lukas. He's simply coming to Moreland Castle to thank the man who had helped his mother many years before. But he gets caught in the intrigue accidentally and is left for dead. Lady Joanna finds him and makes sure he gets the care he needs before he dies. I love that he is a true, honest and noble knight, willing to enter the tournament for Joanna's hand in marriage and willing to help her right the wrongs with the peasant people without thought for his own safety. This medieval romance starts out with a heartbreaking scene that set the tone for the rest of the book. Lady Joanna is kind and good, yet she is guarded by her father’s wolfhound and never given any freedom or touch of concern except from her lady’s maid and Agnes, the healer who was banished from the castle years ago. When she finds a wounded man on the cliff trail as she sneeks away from the castle, she seeks Agnes’s help to care for him. Wool goes missing and her father announces that her han This medieval romance starts out with a heartbreaking scene that set the tone for the rest of the book. Lady Joanna is kind and good, yet she is guarded by her father’s wolfhound and never given any freedom or touch of concern except from her lady’s maid and Agnes, the healer who was banished from the castle years ago. When she finds a wounded man on the cliff trail as she sneeks away from the castle, she seeks Agnes’s help to care for him. Wool goes missing and her father announces that her hand in marriage will be given to the winner of the archery contest Moreland will host soon. Lady Joanna is distraught to be seen as an object instead of a person by her father and the knights entering the contest. What a way cute story, I wanted more! Bessey is a good author, I've always liked her. This was such a well put together story, I just wanted more of the characters and the scenery and the feel of the medevil world. I handed it to my teen who loves midevil stuff. There is talk of God and some prayers this was just a sweet book, a little violence, but not detailed. I loved the last book I read by this author, so I was excited for another. This one has a sweet story with likable characters. The beginning sucked me in right away and the pace is just right, but I found the plot just a bit too predictable. I’m rounding up on this one because I’m such a sucker for this period. I would have liked to see Lord Gilbert a little bit more developed and his relationship with his daughter flushed out, but the arrows fly straight to a happy ending that is still satisfying. Fun easy & clean read. Medieval story about a young lady who is isolated from everyone. She is promised as the prize at an archery contest. Happy coincidence that a handsome young man shows up in time to solve the mystery and falls in love with the girl. Predictable, but cute! Beautifully written and captivating from the first page. I loved the medieval setting of this story. It was great! Full of chivalry, knights, love and mystery. Such a fun , enjoyable book. Loved it! I liked this “tale of honor and love” as described on the front cover! Set in medieval times, it is the story of a young Lady Joanna, and her father Lord Gilbert, who has suffered long from a tragedy he caused many years ago. Joanna’s mother died in childbirth so their father/daughter relationship has been somewhat distant. At age 18, Lady Joanna has reached marriageable age so Lord Gilbert announces an archery tournament, with the prize being his daughter’s hand in marriage. Joanna accepts her I liked this “tale of honor and love” as described on the front cover! Set in medieval times, it is the story of a young Lady Joanna, and her father Lord Gilbert, who has suffered long from a tragedy he caused many years ago. Joanna’s mother died in childbirth so their father/daughter relationship has been somewhat distant. At age 18, Lady Joanna has reached marriageable age so Lord Gilbert announces an archery tournament, with the prize being his daughter’s hand in marriage. Joanna accepts her fate but wishes she could have the love she sees in others around her. On one of her escapes from the castle to visit her beloved friend Agnes, the village healer, Joanna comes upon an unconscious young man who has been beaten, seriously injured, and left to die. With help she brings the young man to the healer’s cottage where they help him recover. Sir Lukas is a knight who was on an errand to the castle until the attack nearly killed him. Sufficiently recovered, Sir Lukas delivers his message but has become involved in the complications going on around him. There are grievous robberies in the village, his attackers must be found, his beloved horse is missing, and genuine love is blooming between him and Lady Joanna that cannot be denied. Much has to be solved and most importantly, he must win the tournament; he has already won her heart. Author Sian Ann Bessey has woven a medieval tale based on a Welsh legend. It is full of adventure, brave knights, intrigue, danger, honor, and the heroine is kind and incredibly brave in her own rite. It did not take me long to love the characters and anxiously root for them all. “To Win…” is not long, but enjoyable from beginning to end. It’s my second book from Sian Ann Bessey, who is definitely on my watch list of fun authors. This book is a keeper in my personal library! I thought this was a good, suspenseful, romantic mystery. Lately, the books I've been reading have been books that spend soooo much time repeatedly hemming and hawing over the main character's thoughts and inner battles, so much so that the books just drag on. It was refreshing to read this book and not have that. I don't usually read books set in the medieval time period and enjoyed learning a little bit more through this novel. Having the glossary of terms at the front of the book was helpful I thought this was a good, suspenseful, romantic mystery. Lately, the books I've been reading have been books that spend soooo much time repeatedly hemming and hawing over the main character's thoughts and inner battles, so much so that the books just drag on. It was refreshing to read this book and not have that. I don't usually read books set in the medieval time period and enjoyed learning a little bit more through this novel. Having the glossary of terms at the front of the book was helpful to not only understand some terminology, but to also picture the castle and how it was set up. There wasn't much romantic tension between the main characters and I had a hard time really imagining much love blossoming between the two, especially in the week and a half or so that this story takes place. They really spent little time interacting. Much more time was spent on the mystery plot. I enjoy a good medieval story and the premise on this one is interesting. Lady Joanna is sheltered and guarded. She's very surprised to learn of a tournament where she's the prize. I have some favorites in this cast, especially the friends she visits outside the castle. Lukas is a good guy. Somewhere along the way my interest in the outcome waned. Maybe the villain is too obvious or unsympathetic? Maybe the love story? Maybe just my timing on picking this up. I'm an animal lover, so I'm surprise I enjoy a good medieval story and the premise on this one is interesting. Lady Joanna is sheltered and guarded. She's very surprised to learn of a tournament where she's the prize. I think I’d rather say 3.5 stars, but 4 will do. This was a cute and predictable love story with some fun characters. I wish we got to see a little more character development in our hero, Sir Lucas. When we first meet him he is unconscious and injured, but we quickly learn that he is an honorable and smooth-talking knight and he stays that way throughout the story. Not that I don’t appreciate his chivalry, but I just think there was a little more we could have gained from his character. Anyways, I think I’d rather say 3.5 stars, but 4 will do. I enjoyed the story, and I especially loved the setting. It's so fun to read Medieval tales, with the language, the castles, the people, etc. There was kind of a weird vibe with the main girl and main guy, and I don't know how to explain it, except that she seems too much like a damsel in distress, and the main guy the hero that gets all the credit. To be honest, I almost didn't finish this book. The first half of the book was pretty slow and it took me quite some time to be pulled into the plot and fall in love with the main characters. It was only at the climax of the story that I really enjoyed this book. In my opinion, it's worth reading the book so you can read the climax and ending. Altogether, TO WIN A LADY'S HEART was a cute retelling filled with knights, castles, love and adventure. This book was so much better than the cover led me to expect! It was exciting, a mystery, an adventure worth reading! I love happy endings...especially with a few surprise twists! I always love a story where (view spoiler)[people who have become bitter find their way out, and family love is restored!! (hide spoiler)] A good read! She began her writing career as a student, publishing several magazine articles while still in college. Since then she has published histo Sian Ann Bessey was born in Cambridge, England, but grew up on the island of Anglesey off the coast of North Wales. She left her homeland to attend Brigham Young University in Utah, where she earned a bachelor's degree in communications with a minor in English.